Okay, I’m already tired of tie-dye. It’s still April and I’m tired of tie-dye. It occurs to me that I am not as young as I was when I started this tie-dye business. I was still in my fifties then. Working twelve-hour days in May seemed like a reasonable thing to do back in 2008. We were a tiny tie-dye business getting ready for a huge festival for the first time and we had to make as much product as we could, even though my daughter had birthed her second child in January of that year and we had to take turns holding him so at least one of us could work on the tie-dye. I remind myself of that first year whenever I get tired of tie-dye and don’t feel like working. We may be busy, but we are not “first big festival with a tiny new baby” busy. That was a huge challenge. This is just work. It would be less work at this point if we were not horrible procrastinators, but we are, so we have to pay the price. The price is long days in May – really long days if we haven’t started them in April. I guess I can say we have started. We ordered blanks last week. They were supposed to be arriving tomorrow, but they surprised us by showing up today. We have checked in our package and thrown one load of cottons into pre-wash. That’s progress. Are we a day ahead of schedule, then? I like to think so. I’m fooling myself, of course, but that’s okay. It makes it easier to get up in the morning and put on my dyeing clothes. The actual dyeing will be happening in May. Before we get to dyeing, we have to pre-wash the new cottons and pre-soak load after load of cottons and Rayons in a soda ash solution. Then they go to my daughter for tying and then they come back to me for dyeing. That’s a lot we have to get done before we even start applying the dye. Still wonder why we charge twenty dollars for a T-shirt? This entry was posted in Uncategorized and tagged procrastination, tie-dye on April 27, 2016 by releaf1954. The answer is no. I know you are wondering if I got my income tax return filed on time. For the first time in my life, I did not file my income tax return on time. My head still has not exploded and the world is somehow still turning. The answer to your next question is yes. My accountant assures me she did file for an extension. Now I theoretically don’t have to panic again for another six months. Of course, I want to get the thing filed a whole lot sooner than that, but I can put off the panicking and that’s what’s important. If there’s something I’m happy to procrastinate about, it’s panicking. I moved on to my Sales Tax return and my accountant moved on to research. She can take her time. When we finally file that return, I want it to be right. Sales Taxes can not be put off. If you have a small business in Florida, you need to keep up with your Sales Taxes. You are far more likely to be audited by the state than by the Internal Revenue Service. My Sales Tax returns are filed quarterly and must be postmarked by the 20th day of the month in which they’re due. I am happy to report that I dropped my Sales Tax return off at the Post Office yesterday. Yes, you read that right – it went into the mail a whole day before the deadline. I would rest on my laurels for a while, but it’s only a bit more than five weeks until the beginning of the Florida Folk Festival and I need to start panicking about the tie-dye now. This entry was posted in Uncategorized on April 20, 2016 by releaf1954. Somehow, my head has still not exploded. I have spent hours and hours reading tax forms and publications, feeling as if my head would explode any moment, but my head remains intact. I am grateful. I still need my head, because I am still trying to understand my tax return and get it filed. I spent all of yesterday and much of this morning reading tax publications and trying to figure out which forms are necessary and what I need to do to make sure they are properly filled out. Yes, I have an accountant, but my poor accountant seems as confused as I am this year. Ours is, apparently, an unusual situation. Let this be a warning to any of my readers who may, ever in their lifetimes, retire. If you decide to do that in December of one year, do not wait until mid-march of the next year to start trying to figure out your taxes. Don’t do it. I kept putting it off because I wanted to make sure all the necessary forms had arrived, but now I’m two days away from the filing deadline and I am still full of questions about the tax consequences of what we did back in December. Yesterday, my head was spinning in the evening and I worried about how I would ever manage to get it to stop doing that and let me sleep. 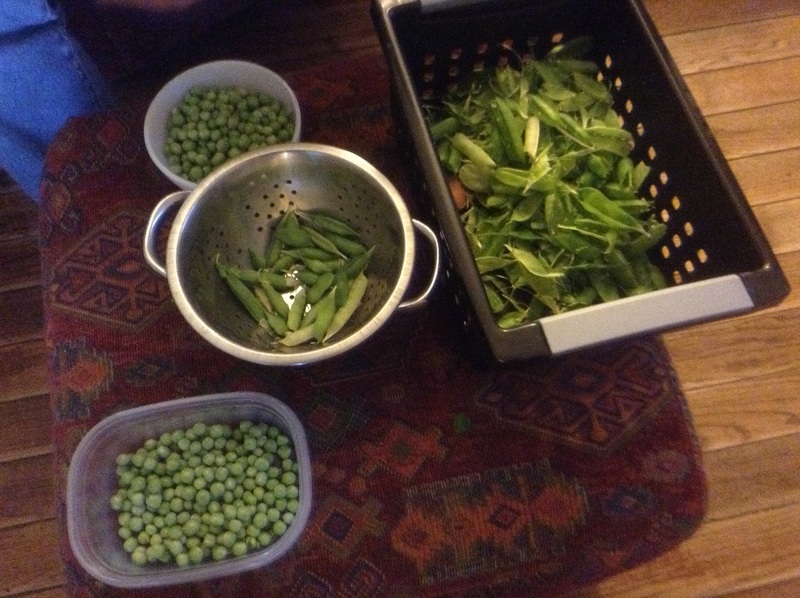 I took a break and went into the living room, where my husband was busy shelling peas he had brought in from his backyard garden. I sat down across from him and started to help. As I opened up the bright green pods and stripped out the peas, I felt my shoulders begin to relax. My breathing slowed. All I did was shell peas, but my attention shifted completely to that activity and my whirling hamster-brain stopped thinking about taxes. My husband found some travel videos on YouTube and put them up on the living room TV. We shelled peas and watched videos of faraway places until all the peas were out of their pods and all my tax questions had given up and gone away for the night. I went to bed and I slept. This morning, I tackled those forms again and reached a point where I could crystallize my questions and send them to my accountant. She has not answered them yet, but I am not going to lose sleep over that tonight. I still have two days and if I can’t work it out in time, I can always file for an extension. If I work it out and then find out later that it was not correct, I can file an amended return. There are options. It will be okay. That’s what the little green peas told me, anyway. This entry was posted in Uncategorized and tagged anxiety, procrastination, shelling peas, Tax forms on April 13, 2016 by releaf1954. I hesitate to even begin this week’s blog post. I wanted to be able to report that my tax returns were all filed. I can’t do that, so I would rather just say nothing and go to bed, but I can’t sleep on a Wednesday if I haven’t blogged, so here I am. Lack of sleep is not something I want to court right now. My brain is wrangling with tax matters this week and it keeps waking me up in the middle of the night as if that is a good time to review 1099-R forms. Trust me, it’s not. I need to review 1099-R forms, but not at one-thirty in the morning. On the upside, the business tax return is filed. That’s usually the one that worries me, but not this time. My husband retired in December, so it’s the personal return that’s complicated this year. We’ll get it done, but meanwhile, I need to figure out how to stop thinking about it long enough to get some sleep. Today, I decided it might help if I could get back to painting. 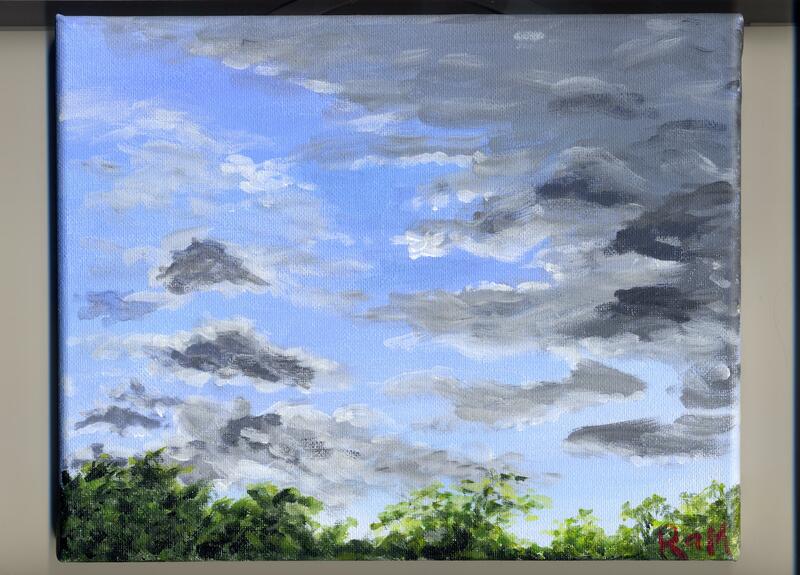 I wasn’t awake enough to try driving far from home, so I painted an afternoon sky from my front porch. It was an interesting sky, with some dark clouds and some wispy white clouds, but as soon as I sat down to start painting, the sky started changing. I painted as quickly as I could but I ended up painting mostly from memory. Clouds are striking and beautiful, but they won’t sit still and pose for a painter. As tired as I was, I still enjoyed spending time trying to capture those clouds on canvas. I’m happy to have a painting to share with my readers. I will be even happier when I can report that all the tax returns have been filed and I am no longer losing sleep over them. This entry was posted in Uncategorized and tagged painting, sleep deprivation, tax returns on April 6, 2016 by releaf1954.